The Akridge Arboretum Park is a one-acre park that was established in 1993. A group of citizens, which is now known as the Akridge Arboretum Society, was motivated to develop plans for restoration of the land that was once used as an elementary school playground and develop a nature park. In 1993, the group reached out locally for assistance in developing and maintaining the facility. The result is a volunteer work force working side by side, planning, and planting with the assistance and support of the City of Calera to develop the park. The Akridge Arboretum Park was developed around the Historic Presbyterian Church, which is now used for weddings and reunions. The park was dedicated and named after the late Willie Akridge for his dedication and service as principal for Calera High School. The Akridge Arboretum Society has recently worked with Landscape Architects at Southern Living to develop a master plan for the renovation of the park which is now in the process of being implemented. For rental information on the historic Presbyterian Church for weddings contact City Hall at 205-668-3500. 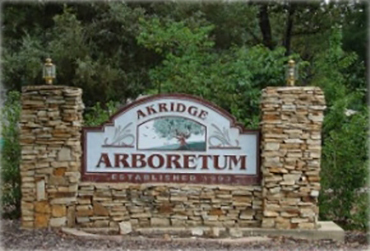 Akridge Arboretum Park is located at 1965 14th Street, Calera, AL 35040.